Three weeks of camp are over and you really seem to be enjoying yourself. Tuesday, you called and asked to come home early because of a headache I think you were really tired. We went to play at Nana and Papa’s house with the Kung Zhu’s. 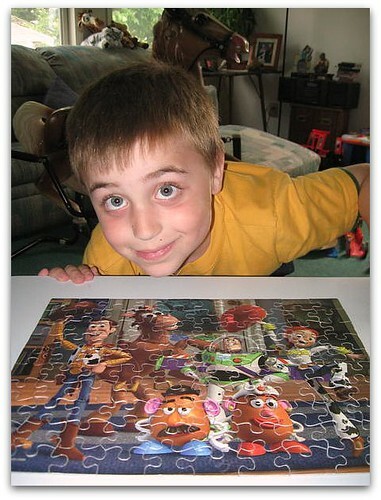 When you felt better, you decided to try the 100 piece Toy Story Puzzle. You ran out of time and we put it away. Wednesday, we were back there and you were determined to complete this puzzle and you did! You were SO proud of yourself. You did it really quickly, so I think we need to check out some even bigger options down the road. 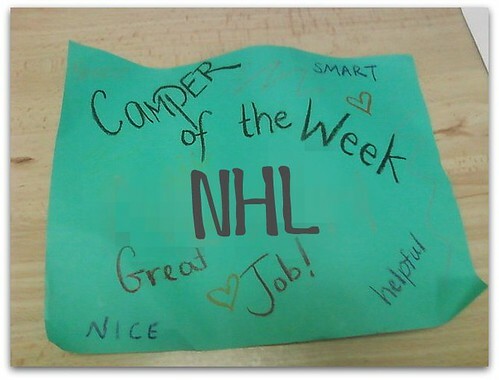 On Friday, when I picked you up from camp, you told me you were the camper of the week in your group. Way to go! They even made you a cool sign to celebrate. This week, there are several field trips that you are excited about. I can not wait to hear all about them and your special long weekend with Nana and Papa. Remember to smile and enjoy – I love your big smile.